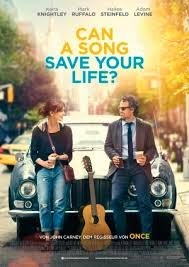 Begin Again is a story of Dan Mulligan (Mark Ruffalo), a "has been" record label producer who is struggling with his life, his relationship with family and his career. One night, he went to a bar where Gretta (Keira Knightley), a songwriter, performs and was captivated by her music. But behind the beautiful song is a painful flashback where her boyfriend Dave Kohl (Adam Levine) is fulfilling their dreams without her. After hearing Greta sing, Dan is determined to create an album with her. But with a love and confidence lost on both people, will they be able to make a music that would speak through the crowd, or will it be another symphony lost? I am rating this movie 5 out of 5 stars because it made me sing, laugh, cry and all the other emotions in it. I love that this is a sort of feel good story and it inspires the people who watch this. After seeing this movie, I'm pretty sure that you'd buy the soundtrack because that's what related me to the story. You see, after a breakup, or even a loss, music is one way to soothe you. No matter how painful it is, if you find the right lyrics to a song, or even a sad melody, it embraces you and becomes your friend. And I believe that Begin Again will be your friend, even after you have watched the show. Begin Again's PH screening is made possible by e-PLUS Tap to Pay and SM Cinema in partnership with Solar Philippines and Solar Entertainment Corporation. Go cashless on your purchases with e-Plus at its partner establishments like Golden ABC’s Penshoppe, ForMe, Memo, and Regatta, SM Department Store in SM Megamall and SM North EDSA, SM Supermarket in SM Megamall and SM Mall of Asia, select SM Hypermarket and Savemore branches, UV Express Terminal in SM Mall of Asia, and Walter Mart Makati Cinemas and Snack Time. Begin Again still shows at SM Cinemas near you. To know more about e-PLUS Tap to Pay and SM Cinema, you may visit www.e-PLUS.ph and www.smcinema.com.